The Blue Yeti is a condenser mic with multiple direction settings, making it a very versatile inexpensive, high quality mic. Condenser mics are very sensitive. Room noise can be a problem. About 2 years ago I set about to create a portable sound booth to use with the Yeti. It began with a cloth, collapsible basket from The Container Store. It was on sale for less than $10. I had some acoustical foam already. You can find it on eBay or at a variety of sound gear dealers. It can be pricey and yes, the quality does vary greatly. But for my purposes I wasn’t terribly concerned with buying or using the absolute greatest foam. You can see from the picture that I used rather inexpensive 1″ foam. I cut it to go on all the interior sides of the basket. I avoided using any at the base of the mic, but you could do that, too if you were so inclined. In such a confined space I doubt you’d notice the difference. The results are noticeable, but you should remember that mic technique plays a huge role in the quality of your recording. Do plenty of test recordings from a variety of distances. Typically, you’ll find things sound best when you’re mouth is a few inches from the mic and you’re talking at normal volume. I posted a test recording (about 5 minutes long) over on SoundCloud. Listen to it and let me know what you think. Total cost, including the Blue Yeti (less than $100) was around $120. 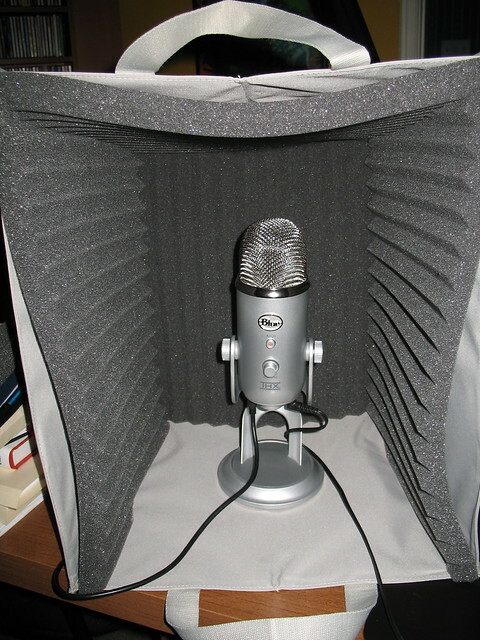 Not bad for a DIY portable sound booth.